Lacrosse Aero Elite Waders are their lightest and most versatile waders yet. With their new AeroForm® boot, they're dramatically lighter, more comfortable and durable. But don't confuse less weight with lacking insulation. Thanks to AeroForm® technology, these boots are warm enough for the coldest waters, keeping you comfortable no matter the conditions. 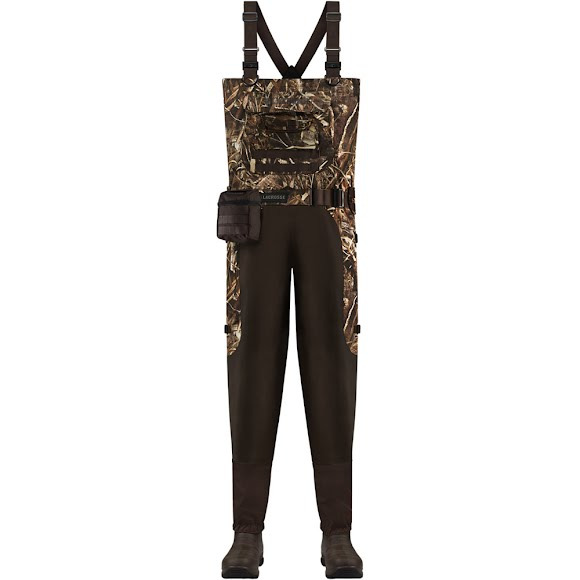 Lacrosse Aero Elite Waders are their lightest and most versatile waders yet. With their new AeroForm® boot, they&apos;re dramatically lighter, more comfortable and durable. But don&apos;t confuse less weight with lacking insulation. Thanks to AeroForm® technology, these boots are warm enough for the coldest waters, keeping you comfortable no matter the conditions. When it comes to support for our durable, waterproof upper, our AeroForm boot is the perfect match. Made of the same material used to insulate refrigerators and freezers, Lacrosse&apos;s polyurethane AeroForm Shell wraps the entire foot for cushioning comfort. Featuring 15mm of insulation over the top of the foot and 20mm underfoot for ultimate lightweight warmth. It is ultra-light and flexible and won&apos;t crack, tear or fade. The combination of their 3.5mm neoprene boot sock and AeroForm technology provides the same warmth as a 1000G insulation level in an ultra-lightweight package.